New Handstand rotating iPad 2 case has been designed for tablets and featuring a hard protected cover for your iPad. Users have been facilitated with 360 degrees of rotating ergonomic freedom and you will switch with even small breeze from portrait to landscape mode. The design of Handstand rotating iPad 2 cover is of course revolutionary and it will facilitate users to manipulate the device so easy without worrying for scrolling from desired pages or opening unwanted applications. 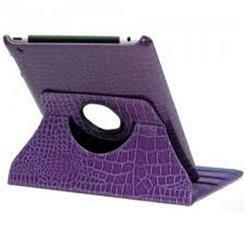 In addition, Handstand case protects the iPad 2 from scratches and offers a straight incline and comes with a slight incline to offer you best typing experience when you have placed it on stable or flat surface. A safety grip has been applied on the hand pad portion of this case and it will confirm the user’s hand to prevent slippage. Its elastic strap offers the easy stability while on the go. However its most important feature to discuss regarding eco-friendly gadget is that; it has been manufactured in the United States using 100 recycled plastic and resin material, making it best eco-friendly and high functional gadget for protection of devices from damage while at workplace or at home. This case is currently offered in many of the colors, best available colors are white, black, blue and bright pink. Discount is available for online users who will purchase directly from the website or Amazon and EBay. Hub International company has manufactured Handstand rotating iPad 2 case, and company has focused on creating eco-friendly products helping individuals and groups or organizations in their personal and business use, to make effective use and best security provided by Handstand iPad 2 rotating case. Jaime Smith, the founder of Hub international told that as iPad is making its way to everyday use by people around the world, we saw a growing need for solution that could enable it to carry long periods of time and give it full security from damages or being broken.